Kailua Kona’s Echo City Knockouts Roller Derby team will be hosting a double header Saturday, April 21st at the Old Airport Hockey Rink! 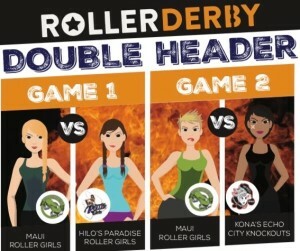 The first game will begin at 5pm and will feature the Maui Roller Girls vs. Paradise Roller Girls (Hilo). Second game will begin at 7pm and will be the Echo City Knockouts (Kona) vs. Maui Roller Girls. This is a free event and people of all ages are welcome! Food from local vendors and team merchandise will be available and a raffle to benefit this non-profit team will be held at the half-times of both games. There will be an after party at My Bar directly following the event and spectators are welcome! Come out for a night of athleticism, food, and fun!